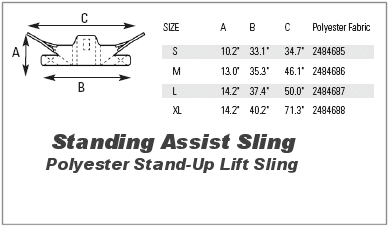 The Standing Assist slings are for residents who are partially dependent, have at least 60-percent weight bearing capacity, have head and neck control, are cooperative, can sit up on the edge of the bed (with or without assistance), and are able to bend at the hip, knees and ankles. 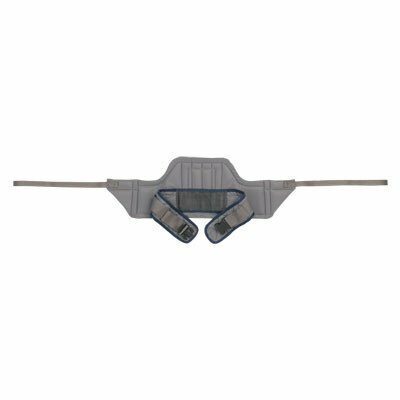 Use the Standing Assist slings for standing assistance, quick toileting, weight bearing practice and for transferring resident from bed to chair, or chair to bed. Small: 10.2" 34.7" 450 lbs. Medium: 13.0" 46.1" 450 lbs. Large: 14.2" 50.0" 450 lbs. 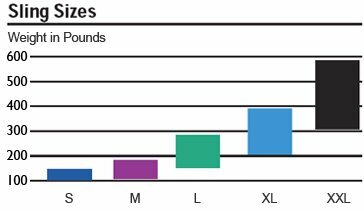 X-Large: 14.2" 71.3" 450 lbs.